HIV & AIDS Information :: PrEP - What are the side-effects of Truvada? What are the side-effects of Truvada? As with other ARVs, Truvada can cause short-term side-effects including nausea, tiredness, gastrointestinal symptoms and headache. These are typically experienced by up to one-in-ten people during the first few weeks on the drug only. Truvada was selected for use as PrEP partly because it has relatively few long-term side-effects. Nonetheless, there are some concerns about tenofovir (one of Truvada’s components) in relation to reduced kidney function and bone mineral density. These problems have been noted in small numbers of HIV-positive people, especially older people, who have taken tenofovir for several years. 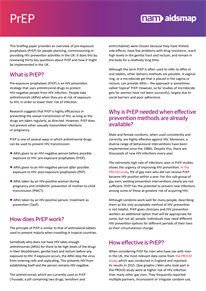 They may have less impact on PrEP users, who are likely to be younger and to be on PrEP for shorter periods of time. But these issues should be carefully monitored as PrEP is rolled out over the next few years. In PrEP studies, use of tenofovir has been associated with small decreases in key measures of kidney function (creatinine clearance and glomerular filtration rate, GFR), affecting up to 2% of participants. These returned to normal when PrEP was stopped, including in one study in which people took PrEP for up to five years. Losses of bone mineral density have been minimal and also appear to be reversible.